Wednesday April 1st 1896 I sewed a little this morning. We had dinner before twelve oclock and went out to see Lew & Mary Price. Did not find them at home and came directly back. It was very cold and windy. I did a little more sewing and my usual evening work. Thursday April 2nd 1896 It was cold and the wind blew a perfect gale. Will went down town for the mail. I cut out a new calico dress for myself and sewed all day. I read in the evening. Friday April 3rd 1896 The weather was more moderate. I was sewing nearly all day. The boys worked in the field some. I pout out some little chickens today the first of the season. 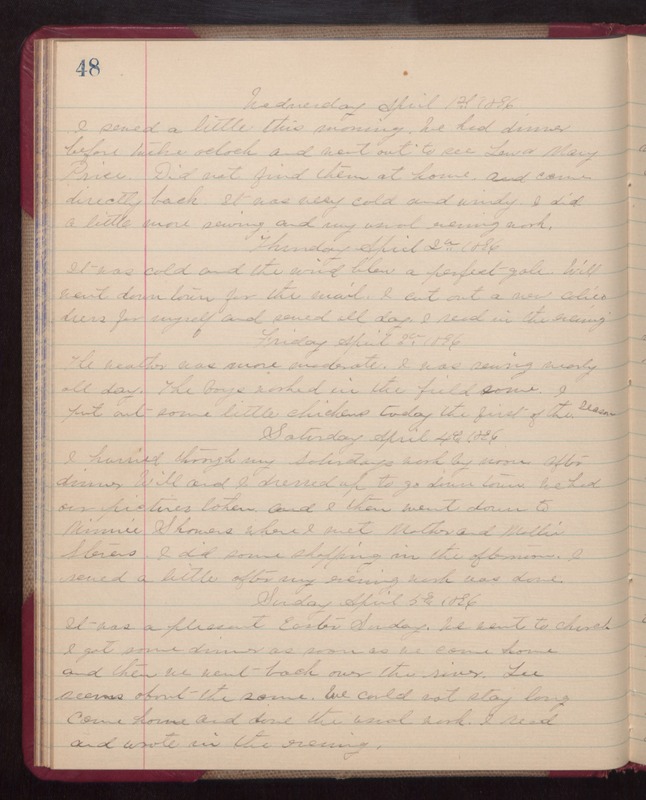 Saturday April 4th 1896 I hurried through my Saturdays work by noon. After dinner Will and I dressed up to go down town. We had our pictures taken and I then went down to Minnie Showers where I met Mother and Mollie Stevens. I did some shopping in the afternoon. I sewed a little after my evening work was done. Sunday April 5th 1896 It was a pleasant Easter Sunday. We went to church. I got some dinner as soon as we came home and then we went back over the river. Lee seems about the same. We could not stay long came home and done the usual work. I read and wrote in the evening.